Bangkok has been named the world’s best city for tourism, based on the MasterCard Worldwide Global Destination Cities Index 2013 survey collected from 132 countries. The survey indicated that Thai people’s hospitality and kindness are the main factors for this top ranking. On Monday the 27th May, Matthew Driver, the president for Southeast Asia at MasterCard Inc, presented the world’s top travel award to Bangkok governor Sukhumbhand Paribatra at the St.Regis Hotel, Bangkok. According to Mr.Driver, the ranking is based on the number of international visitor arrivals and their spending, exclusive of airfare, in each of the 132 destination cities. Bangkok beat out London, Paris, Singapore, and New York, which came in second, third, fourth,and fifth, respectively. A noticeable trend in this year's report is the dominance of the Asia-Pacific region. Of the 132 cities ranked, 42 are in Asian countries; led by Bangkok and followed by Singapore, Kuala Lumpur, Hong Kong, Seoul, Shanghai, and Tokyo. It is also expected that fast growing Asian cities such as the Arab Emirates and Istanbul may rise forward ahead of Singapore, New York, and Paris by the year 2016. Governor Sukhumbhand said he felt great joy in representing Bangkokians in receiving the title for the world's top tourist city, which marked the first time any Asian city has been projected to be the top-ranked tourist destination. People are packing their bags and heading to Thailand. 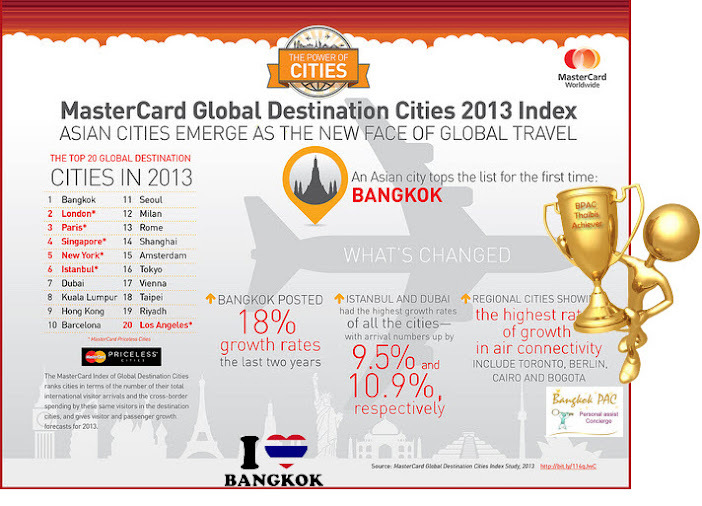 The country’s capital — Bangkok — is now the most visited city in the world by international tourists, according to the third annual Global Destination Cities Index released by MasterCard. Bangkok beat London, last year’s No. 1 tourist destination, by less than 1%. rowing wealth of Asia and its importance as a business destination. Bangkok’s rise to the top spot, with 15.98 million visitors projected for 2013, is the first time for an Asian city since the Global Destinations Cities Index launched in 2010. London is expected to have 15.96 million visitors in 2013, and Paris, in third, is forecasted to have 13.92 million. While Bangkok claims the title of most visited city, halfway around the world in New York City, foreign visitors are shelling out more money than in any of the other 132 cities surveyed, despite expecting 4.46 million fewer tourists. Visitors to the Big Apple are expected to spend roughly $18.6 billion in 2013 — that’s a whole lot of “I ♥ NY” T-shirts. Meanwhile, Tokyo remains the world’s most expensive city, as measured by total spending per tourist, with the average visitor spending nearly $2,200, according to the Atlantic. Just imagine how many trips to Bangkok you could take with that much money.